This investigation was particularly interesting to sample a suspected problem installation of spray polyurethane foam (SPF) insulation. After cutting a wedge out of the foam to access the profile for sampling, VOC meter readings indicated elevated levels from incomplete chemical reactions necessary for proper curing. 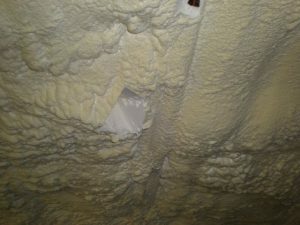 Many class action lawsuits are currently underway against product manufacturers and installation contractors for improper applications of the SPF insulation. In this photo a roof rafter running a few degrees off from vertical is covered with the foam due to over application. 2017 Project. Clean Air Sciences, Inc. is fully insured and carries general, professional, and microbial consulting liability insurance. Compare the competition, few carry any insurance and even fewer have more than general liability. Find out why it is so important for mold and indoor air quality issues that you should ONLY hire a field scientist/investigator who is certified through the American Council for Accredited Certification (ACAC). Click on this link to view a brief video about ACAC certifications. …and many more in between. …and many other towns along the IL border. Please beware of "mold inspectors" and former home inspectors who claim to be qualified and "certified" to perform residential and commercial mold investigations. Find out who they are "certified" through, if it is valid and current, and whether the program is third party accredited like ACAC certifications are. Many of our clients hired an unqualified "mold inspector" who was unable to solve their problems before they came to us - make sure that doesn't happen to you too so you don't waste your money and time.